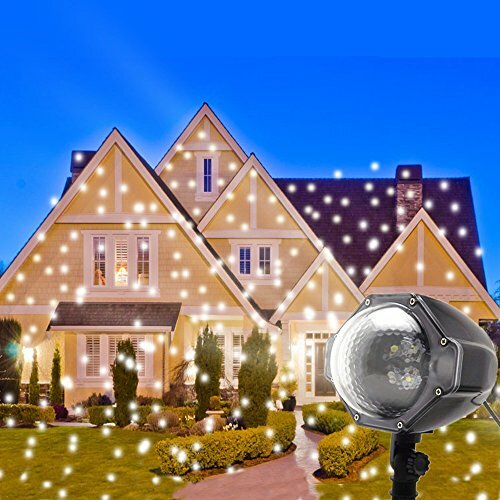 This Christmas Projector Lights is widely used in Christmas, Valentine's Day, Wedding, Party and Holiday decoration. The realistic LED Snowflake Lights effect is very romantic which will surprise your friends, neighbor, especially your Children. The power plug has a special design to keep it waterproof. Please follow the user manual to connect it correctly. If you have any question on this part, please contact us for guiding. Built in timer. Automatic turn off on 6 hours (cycle every day).The LED Snowflake Light come on automatically to the last setting when power is applied. For example, you turn on our Christmas light projector at 7 pm and it will automatic turn off at 1 am. And it will automatic turn on with last setting next day 7 pm. ETL cETL Safety certificated adapter Christmas projector Lights, Low Output Voltage DC 5V, 1500 mA LED Snowflake Projector Lights, More safety for your family! Projection Area from 15 to 50 m2. The LED Snowflake Projector have 5 meters wire. You can change Christmas Projector Lights area as you want. 9 Functions available: Fast falling snow, Medium, Slow, Still, Gradual Change, Turnoff with Memory, Gradual Change in Fast, medium, slow speed. You can press the button on the back of Snowflake Projector Lights to select play mode. Good LED Snowflake Lights Decoration and Christmas Projector Lights For You! If you have any questions about this product by Xibaisi, contact us by completing and submitting the form below. If you are looking for a specif part number, please include it with your message.